Today I’m delighted to have a guest post by Emma Jane Holloway, author of The Baskerville Affair trilogy, in which she discusses incorporating plausible details and reality in fantasy fiction. The Baskerville Affair, described on the author’s website as “one part mystery, two parts adventure and a wee pinch of romance,” begins in London in 1888 and focuses on the adventures of the niece of Sherlock Holmes, Evelina Cooper. Even though the first book will not be released until next week, there is not a long wait for a finished trilogy at all since the books will all be available by the end of this year—A Study of Silks will be released on September 24, A Study of Darkness in October, and A Study of Ashes in December. I’d like to claim that Gandalf visited me in my dreams and bestowed upon me the magic gem of Zod, and henceforth I wove enchanting tales of wonder. Sadly, no. It was more like the lack of enchantment in public school drove me to read under my desk while the teacher was talking. Short of (metaphorically) chewing off my own limb in search of escape, my best option was to stealthily slip away into everything from Alan Garner to Robert E. Howard. If a book had swords I liked it, and when I ran out of stories to read I started writing them. Needless to say, I turned in some curious English essays. And while that inspired me to dream stuff up, I probably should have paid more attention during physics and chemistry. Then at least I’d be better prepared to write about blowing things up. What I didn’t understand was that even fantasy is made up of information, and one of the pitfalls of telling lies for a living is that there is a limit to how much one can fake it. Characters are inevitably bound by what their creator tells them to do, and if the author is clueless, sooner or later it shows. 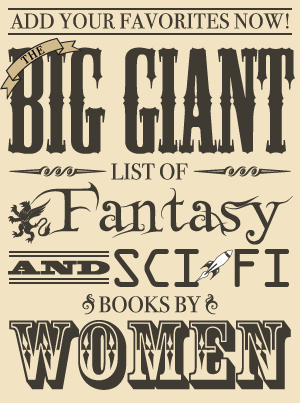 For me, this came to a head while writing my trilogy, The Baskerville Affair. 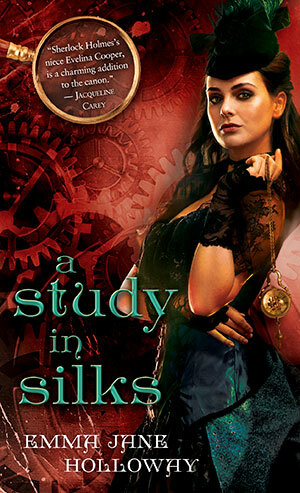 The first book, A Study in Silks, was relatively easy—there is magic and derring-do, but the young protagonists are in nineteenth-century Mayfair worrying about careers and courtship because that’s what young folks do. No problem. Book 2 is darker and the physical action ramps up, but we get through it fine. Book 3—the grand finale—was different, because it truly launched into fantasy territory. Major battle scenes. Death sorcery. Crashing steampunk monsters. Airships. Multiple armies. High magic. All very groovy, if you like things that go boom. I confess, I stalled. It was the first time I’d really tackled battle scenes on such a large scale. Furthermore, I do not have direct experience with earth-shattering cataclysms, unless you count deadlines. So there I was, all my characters staring at me with “what now?” written on their faces. The answer was beer and macaroni, and a lot of patience. The beer was for me. The macaroni was for research purposes. Maybe I hadn’t been at an apocalyptic battle lately, but I could recreate one in miniature. I needed a tactile, visual way to work out what was happening. Sure, I did some reading about actual battles (navy battles in particular—if you think vertically as well as horizontally, they work pretty well for airships) and the 1830s in Paris is a rich source of detail about nineteenth-century urban rebellion. 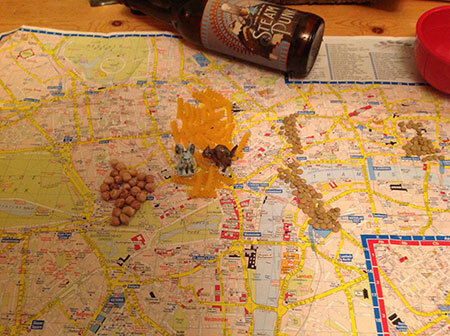 But the whole thing came together for me when I spread out a map of London and slowly began plotting the action move by move. I’d been to the relevant parts of the city recently, and that helped, but I needed more since I wasn’t actually there during an attack by clockwork monsters. In fact, I’d avoided most of the tourist season altogether. Beans, pasta, lentils, and chickpeas became my forces. By moving them around the map, I got a far better sense of how my scenes should play out, and especially what would go wrong. Just try getting all those chickpeas–er, steampunk death spheres–across a bridge fast enough to cut off the rebel macaroni. The point? Despite what I believed in school, good fantasy requires a lot more reality than one suspects. To make it good, I need plausible details. Sometimes that means research, and sometimes that means thinking a campaign through as if I was really going to fight it. I need to believe in the story, down to the smallest detail. It’s the only way my characters can figure it out. And until Gandalf shows up with some spiffy magic—or more lentils—finding the truth in my fiction will always require curiosity and a willingness to be both serious and absurd. And, occasionally, a lot of work. So, given the importance of fact to fantasy, would I tell my younger self to get her nose out of that book and pay attention in class? Maybe some, but not completely. The other thing that any writer requires is a fierce desire that will carry a dream from page one to The End, and that doesn’t flourish without a little rebellion. So what if my memories of plane geometry are inextricably mixed with Conan the Barbarian? By Crom, it’s a consequence I’m more than willing to bear.